What is Saddle Stitch Binding? - ColorFX Inc. 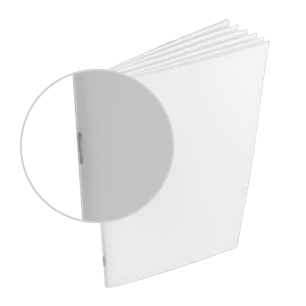 Most common type of binding, is stapling sheets together where they fold at the spine. They are commonly used for Booklets, brochures, newsletters, pamphlets, direct mailers, magazines and catalogs. Fast & Inexpensive [least expensive of all binding options]. Widely and readily available, since most printers saddle stitch in-house. Accommodates special inserts like business reply envelopes, membership forms, order blanks. Gatefolds and foldouts are possible. Can use a self or separate cover. Longevity. Not recommended for pieces intended for heavy use. Not possible to bind in a single leaf of paper [as in perfect binding], but single leaves canbe stitched into a saddle stitched book if it has a 3.5″ inch flap, or extension. Thickness limitations. Documents thicker than 0.25″ inch may require another binding technique. May require special design adjustments for creep, especially small formats with high page counts. Signatures are folded with a bind fold [a fold in the paper, which allows a mechanicalor suction device to find the center]. Signatures are opened with suction cups or mechanical grippers. The signatures may then be transferred to succeeding feeding stations. This is howsaddle stitched signatures are inserted into each other. Covers are scored and folded on the saddle stitching machine. Then they are laidon top of the signature[s]. The product is stitched through the fold, trimmed on three sides. Next What is Coating or Finishing? Previous What are the limitations to printing on the spine of a perfect bound cover? On a double loop book with a concealing cover?